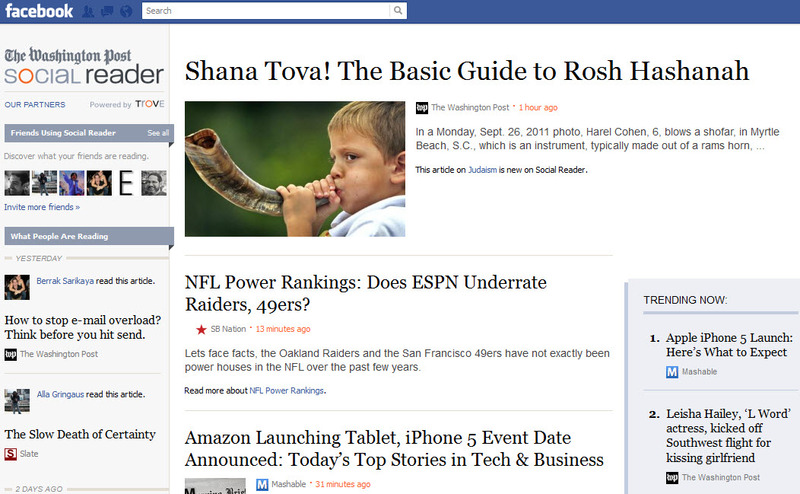 Based on first impressions, I have to say I like The Washington Post’s Social Reader on Facebook. There are enough additional sources to offer a wide range of content choices which makes it more engaging. And being able to read the articles right in the app is a big plus. That alone is a big step for publishers, who are understandably tentative about social efforts that are not directly focused on bringing users back to their site. But with the right monetization strategy there is no reason that a news organization needs to be limited to the confines of its own website. Reporting friend activity gets overdone in social media, but in this particular app it did successfully get my attention. I was curious to check out what some real friends had read. And seeing that Brian Solis – who isn’t an actual friend but is a respected voice in the industry – had read certain articles did encourage me to click on them. 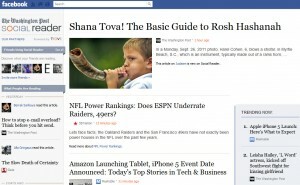 Overall I’d give Social Reader the nod over WSJ Social which launched just before it. For more background information check out Robert Scoble’s video interview with company chairman Don Graham. The Washington Post is actively recruiting more content partners. I’m not familiar with the terms but it is worth investigating. And I’m sure more publishers will follow The Wall Street Journal and The Washington Post’s lead and come out with similar offerings soon. At that point it will be interesting to see what happens. Once everyone is doing it, how much attention and engagement will each get? For more on the impact of Social Reader on users’ news feeds, see Why Is the Washington Post at the Top of My Facebook Feed Yet Again? from Liz Gannes of AllThingsD. I will never get to understand why they put readers on facebook, facebook should NOT be used as one website owning the web, it should be just another site. I highly dislike the fact that most of today website use facebook to “lift them up” and using it as their “father”. Old websites succeed on their own, you should do the same. You have a valid point Mark; in developing various social outposts it is very important to still treat your own site as the mother ship. That is particularly true for companies whose primary business is not producing content. But for large news organizations like The Washington Post that have deep, content-rich sites with new material being added every day, there is more opportunity to experiment with allowing users to interact with some content in other locations – without significantly impacting the main site. Particularly if you can monetize the outpost activity, and come up with smart ways to bring users, links and social shares back to the main site.